On June 21st the Party on the Pier will light up the waterfront in Charlestown. Join us for our 10th annual Party on the Pier, sponsored by Cisco Brewers! We'll dance away the evening to music from DJ Ryan Brown on Pier 4 under our tent, provided by Peak Event Services, and enjoy delicious food from Boston's best restaurants and food trucks, as well as drinks from Triple 8! This is one summer event you won't want to miss. Thank you so much for coming out to the largest party on the waterfront this summer, and for supporting Courageous Sailing. Tickets are no longer available online, so please buy your tickets at the door! Members, neighbors, volunteers, parents, young professionals, sailors from throughout the region and anyone who wants to have fun while supporting Courageous Sailing - you and your friends! You must be 21 or older to attend this event. Proper identification is required for guests to receive an alcoholic drink wristband. Parking is available at the Nautica parking garage at 88 Constitution Road. Click here for a map with directions by car, mass transit, bicycle, and foot. You should bring only what you need. This is an outdoor venue. There is no place to store your personal belongings. General inquiries can be directed to Jacob Breslin at Courageous Sailing. Call at (857) 452-1759 or email jacob@courageoussailing.org. Yes, tickets will be available at the door. Drink tickets will be available for purchase. Cash or cards will be accepted. Tickets to Party on the Pier are not refundable. 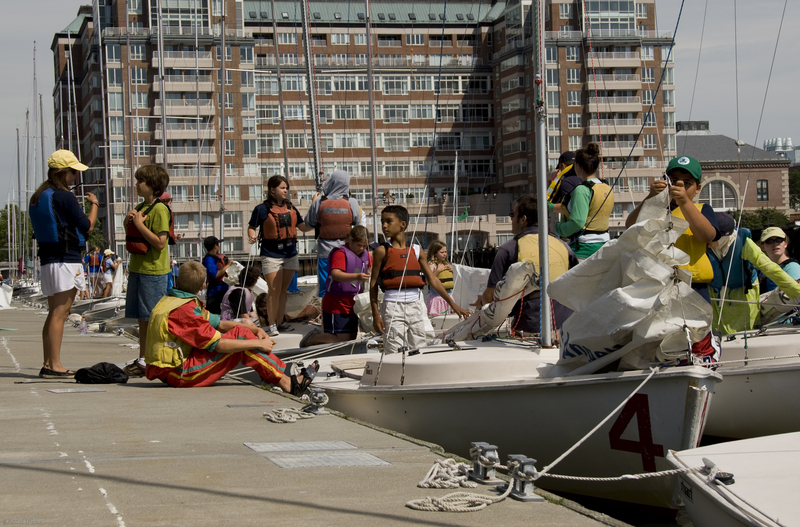 Beautiful springtime weather in 2017 enabled 60 4th through 8th grade students to participate in weekly afterschool sailing programs on their home neighborhood’s scenic waterfront. Sessions were held on Mondays, Wednesdays, and Fridays during the final four weeks of the school year. With the help of the coaches and members of the Boston Latin High School Sailing Team, a group of older sailors were given the opportunity to sail our 420 racing dinghies, which are used nationally by competitive high school and college programs.